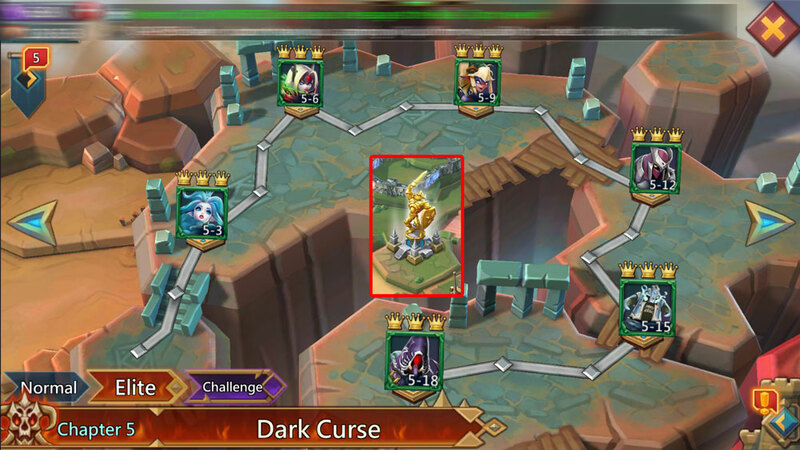 Chapter 5 of Lords Mobile Elite Stage is called the Dark Curse. Are you feeling scared? You shouldn’t. They used too much drama and not it is no longer effective. They should have called it “Red Curse”. That would be scary. Dark Curse is just lame. The good news is that Chapter 5 is not too hard. Here is my walkthrough on how to finish Chapter 5 Elite of Lords Mobile with Free to Play Heroes that are as weak as possible. I know that the picture demonstrations show maxed out heroes. You won’t need such powerful heroes to win! Best Hero Lineup: Sage of Storms, Child of Light, Oath Keeper, Bomblin’ Goblin, and Prima Donna. This challenge is a little longer than usual but it shouldn’t be too hard. You will want your heroes to be at least at level 41-44 in order to finish this level successfully. Obviously, you will also want to have as many medals as possible! If you can’t seem to win this stage, level up your player level and try again! Stage 1: Keep an eye on your heroes health. Just keep making sure that you ultimate-heal the heroes with the Prima Donna before the other heroes drop dead! Once you have only 2 archers remaining on the battle-field start saving up your ultimates! Stage 2: Rather easy. Just kill everyone and try your best to save the ultimates for stage 3. Stage 3: In this stage, you will have to fight with the Snow Queen. Without the following simple trick, you may have a difficult time. Space the stuns-attacks apart from each other! First hit her with Child of Light – then wait a few seconds until you see her gearing up to attack again – and then hit her with Oath Keeper. When Snow Queen gets killed, another 4 monsters will appear. Pay attention to when your Prima Donna reaches her ultimate-power and make sure that she is there to save your heroes from dying. Yay. You’ve come far. You are so good at Lords Mobile. I think that you may deserve a reward! Bleh. I’m not your life coach. I’ll stop! Declaring the best lineup for Elite stage 5-6 may be complicated. There are multiple options that will work. This lineup will work with level 47 heroes with silver and green badges… So don’t use the excuse that my heroes are maxed up like monsters! Hero Lineup: Tracker, Demon Slayer, Death Knight, Prima Donna, and Trickster. Stage 2: Don’t do the Dark Knight, Tracker, and Trickster’s Ultimate attack straight away. As soon as the reinforcements arrive focus all of your anger on the Femme Fatale. She can easily tear apart your heroes if you don’t finish her off quick! Stage 3: This level is easy. Just focus on the Black Crow and you’ll be fine! Unless you’re drunk. If you’re drunk, you need to get sober first. The Hero Lineup for 5-9 Elite Stage can be easily done with 48-level heroes: Tracker, Night Raven, Death Knight, Prima Donna, and Black Crow. Stage 1: This stage is really easy. Just keep an eye on Death Knight. Make sure that you use the Prima Donna Healing Ulimate before he drops dead. Otherwise, save all the ultimate attacks for Stage 2. Stage 2: This stage may seem overwhelming because it is reminiscent of other elite challenges that are actually tough. In actuality, it is really easy. Focus on the big turtle unless you can see any turtles attacking Prima Donna. Protect Prima Donna at all costs! Stage 3: This stage can be difficult. If you have low-level players you may need to redo it a few times until you get it perfect. Start off stunning Scarlet Bolt with tracker, wait for her stun to wear off and then hit her with Night Raven and Death Knight. When Petite Devil shows up from behind, hit her with Black Crow. Hopefully you should be able to do the rest with regular game-play. The heroes for this stage need to be at least level 49 or 50 and green badge. Hero line-up: Prima Donna, Bombin’ Goblin, Oath Keeper, Snow Queen, and Black Crow. Stage 1: Let all the heroes chip away at the enemy at first. Once there are only a few enemy soldiers left, start saving your ultimate-attacks for the stage 2. Stage 2: Just focus all your ultimate attacks against the Centaur. Stage 3: The trick for Stage 3 is going to be to stagger your ultimate spun attacks of Snow Queen and Oath Keeper against the Shade. If you can keep him spinning like a drunkard for long enough, you can win this game. Just one note. As soon as you see the Dream Witch show up in the back hit her with the first available ultimate. She can be really dangerous if not killed quickly. Here is my lineup and explanation on how to unlock the 5-15 Elite Stage. The heroes do not need to be maxed up to the level that the image below shows. Level 45~ should be enough. Stage 1: This stage is really easy. Just let your heroes kill the enemy. Don’t use up any of the ultimate attacks unless you have to! Stage 2: This stage is also really easy. Use a few ultimate attacks. Keep an eye on the Scarlet Bolt’s health and use Prima Donna if she gets too low. Stage 3: This stage can be difficult if you aren’t careful. The objective is to protect Scarlet Bolt from dying and therefore keep Prima Donna ready to heal when she get too low. You also have to make sure that the smaller heroes that pop-up later don’t kill Prima Donna. As soon as they appear have them killed quickly! The rest should be easy! Hero Lineup: Tracker, Night Raven, Oath keeper, Prima Donna, and Black Crow. Stage 1: Easy. Just let the heroes do there thing. Don’t use any ultimate attacks. Stage 2: Wait a 1-2 seconds before using the Oath Keeper on the enemy. You want to make sure that they are all in range! Use a few ultimate attacks on the enemy group and include the boss of the level. Towards the end of the stage begin saving the ultimate attacks for the next stage. Stage 3: Focus on the two fairies on the sides and the Demon Slayer. The Demon Slayer can mess up your back line, so make sure that you take him down quickly! Click here to read my guide on how to unlocked Elite Stage 6.